When you are thinking of a family home what do you see? I'll bet this place is it. Welcome to the UPLANDS, the part of Oak Bay with no visible electrical wires. Bright, extensively updated and upgraded and move in ready. The main floor addition was created by well known Architect, Nigel Banks. Modernized by the open concept living of the kitchen/family room, the perfect laundry room setup with lots of cupboards and counter space that continues to a large Master Suite, large walk-in closet and an ensuite with elevated counters all feeling like a separate wing that leads to a patio door from the Master suite to the glorious private back garden that awaits a hot tub experience. A high efficiency gas boiler with a recirculation system to provide hot water on demand, HVC (heating, ventilation and air exchange) Pella Windows and doors. Modern kitchen with pull out cabinetry, pantry, under counter lighting, gas range and an elevated dishwasher. Oak floors throughout most of the home with a square shape staircase leading to three additional bedrooms, ensuite and another spacious full bathroom. Additional patios and decking added to several areas to allow for more flexibility along with a fully fenced property and framed high hedges on three sides, perfect for a family pet. Royal Victoria Yacht Club just around the corner. Convenient bus route access to the University of Victoria, Downtown, Willows Beach and more. 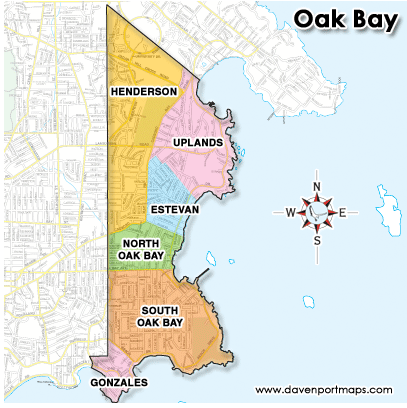 Below is a coloured map outlining the different areas within Oak Bay.